As I have written elsewhere I started out on the Nahanni trip with camping gear, packrafting gear and food that together weighed around 23 kilos (50 lbs). I have also commented on some of the stuff that was in the pack. In this entry I will comment on some gear that became, or remained, favourites. There were also one or two things that did not work very well. 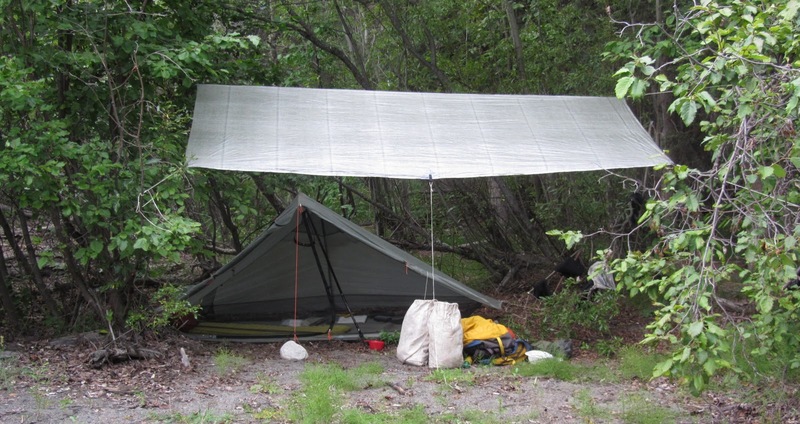 A favourite piece of gear was truly my tarp, which was used on so many occaisions. If it rained at night I cooked under it, some distance from my tent. If it did not rain at night I still cooked away from my tent, but did not rig the tarp where I was cooking. Here it is rigged over my tent at night. In case morning came with rain I would simply get out of my tent, take it down, tuck it out of smells way and proceed to cook breakfast. I did not think food smells earlier days would linger in the tarp to any extent that might make it less advisable to pitch by the tent. This could be wrong, but on the other hand I saw no bears for the whole trip. I made the tarp myself from Cuben fiber bought from http://www.extremtextil.de/. I used the lightest available material; 19 grams/sgm and bought 6 meters of 1,38 m wide material. This I cut into two 3 m length and taped them together, creating a ridgeline, using the special tape sold by the company. I then made a hem around the perimeter and attached 8 loops, 4 at the corners and the other ones in the middle of each side. 220 grams in total with eight 2 m (6 foot 8 inches) cords attached to the loops. This would make an excellent shelter for fairly protected camps after (or before) the bug season. 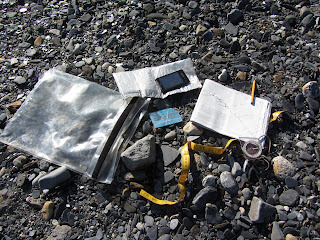 My navigation gear: map, river guide, tape measure, compass and cell phone with GPS. 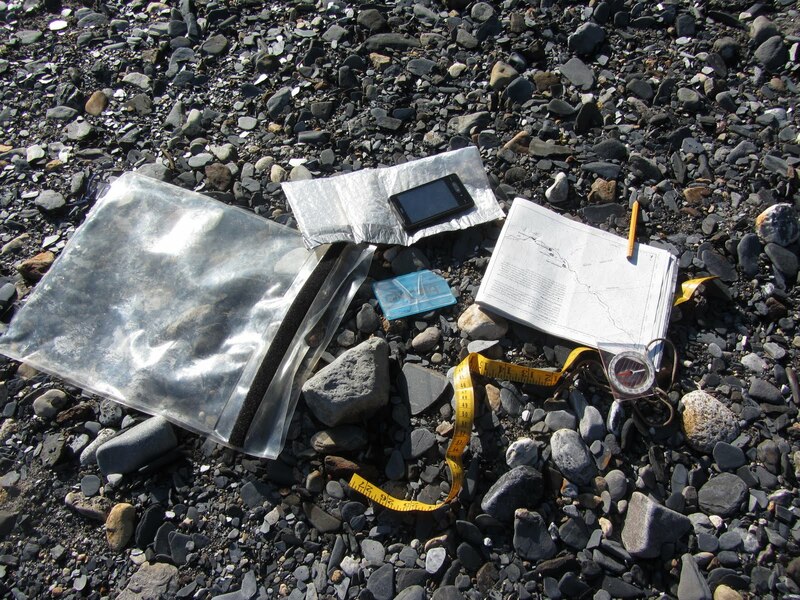 All kept in a water-proof Ortlieb map case strapped to the top of my pack on the foredeck of the raft. 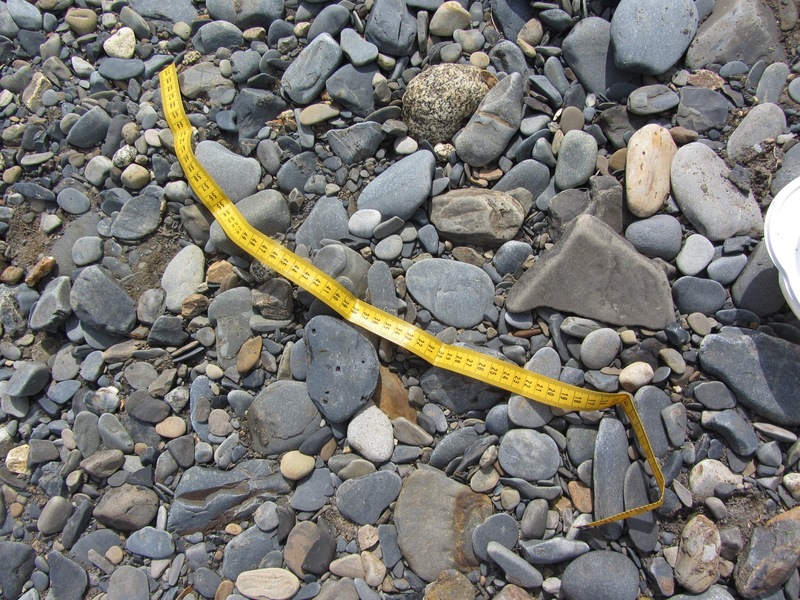 I guess the tape measure needs an explaination. I relied heavily on dead reckoning to get a position every night. 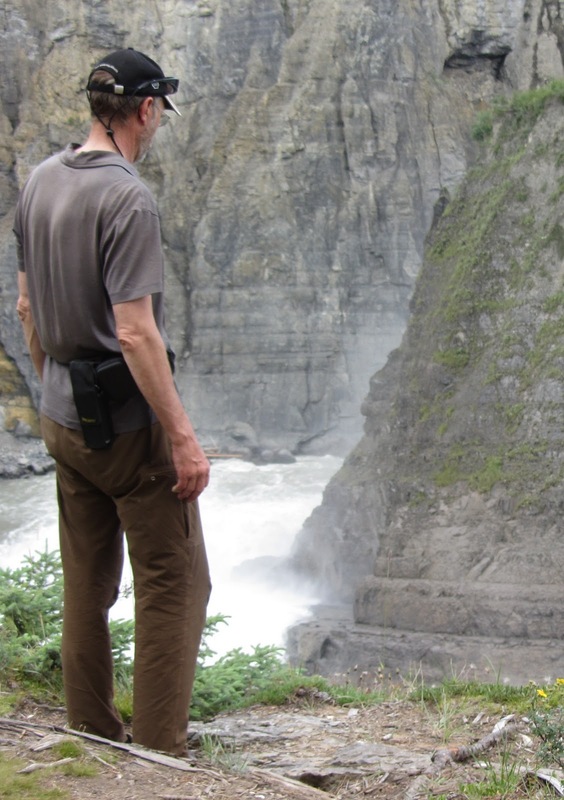 That meant taking a GPS reading at some spot that I passed, like a major tributary of the Nahanni. Stopping at night I would simply check the distance from where I was to this spot and measure the distance as the crow flies, with the tape measure. Since I was on the river all the time this was sufficient. 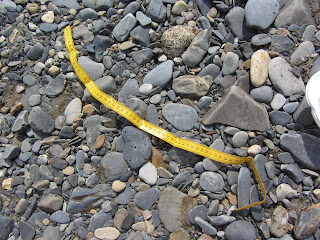 Normally the compass works well for measuring distances like this, but since I frequently travelled 50-70 kilometers every day I simply needed something longer, so I cut of a piece of tape measure that was, if I remember correctly, around 80 centimeters or so. It did not weigh many grams and worked very well. Three favourite pieces of gear in one photo; Icebreaker Kent merino shirt, BPL Thorofare pants and Salomon Tech Amphib shoes. The Kent is one of my absolute favourite pieces of clothing ever. I have used it for 5-6 years and the shoulder straps of my pack have yet to wear through. The merino is wonderful of course, and dries quickly. I have put it on more or less soaked and hiked it dry in a couple of hours, without feeling uncomfortable. It is faded but still stylish. Compared to a t-shirt I find that the collar makes it look more presentable around trailheads as well as adding an extra bit of warmth if you raise the collar and and fold it around your neck, sort of like a gaiter, inside a windshirt. The Thorofare pants are simply unbelievable at 120 grams of thin, stretchy material. I have a pair of homemade thin pants that weigh 160 gram that have been just great, but I'm sad to say that the Thorofares have them beat. A zippered leg pocket is excellent for money and tickets when you are sort of in transit. However, the best thing about them is that they dry out faster than you would think possible. Five minutes after fording up over your knees and they are dry, with the exception of an maybe an inch around the bottom hem. And they are unbelivably tough and hard wearing. 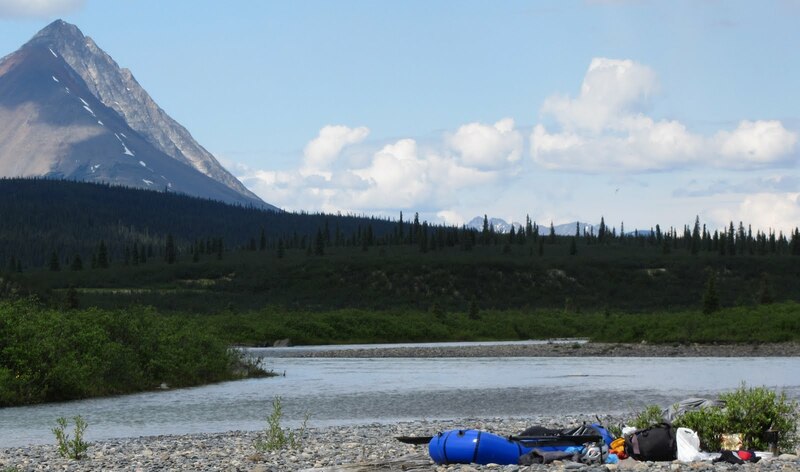 On the Nahanni I spent at least two non-rainy days (when not wearing my dry suit) pushing my way through some of the worst underbrush I have encountered. I know of people who, without having tried thin modern materials themselves, claim that thin garments like windshirts will shred after five minutes of bush-whacking. They do not know what they are talking about. There is still not any rip on these pants, just a bit of piling on the thighs, showing that they have been used. Interestingly enough they have suffered the same fate as my homemade trousers; the thread used for the bottom hem has broken from wear and tear, but the cloth itself is undamaged. 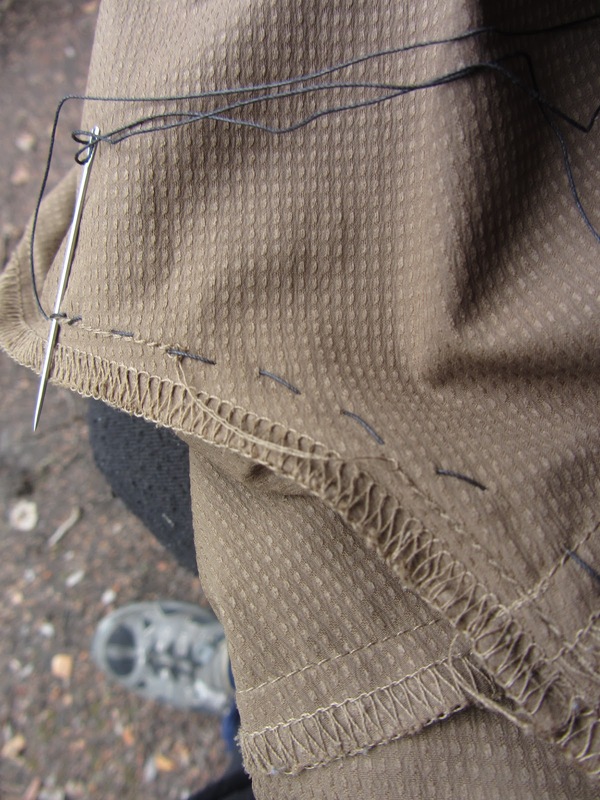 I had to tape the bottom hem on the inside of both trouser legs along the Nahanni when this happened. When I returned home it was of course easy to re-sow both hems. The seam at the crotch also showed tendencies to break, which I fixed at Virginia Falls (see photo). I have used Salomon Tech Amphibs since 2004 on almost all longer and shorter hikes I have made. I usually wear out a pair every year, since I use them in town as well. What I really like about them is that they are spacious and expandable. This means that they have room for thick pile socks and Goretex socks on top, when the going is very wet and cold. This is seldom needed. But that they also work with the thinnest nylon socks you can imagine (50 denier 'ladies socks' that I usually buy in the super market, 1 pair lasts a week). I know people that think they are too soft around the heel and heel cup to feel stable. Yes, they are not very good at traversing steep slopes off trail. Still, how shoes work and fit is very personal and what works for one person might not work for, or fit, another. I simply know that I love my Salomon Tech Amphibs and cannot think of shoes I would rather use for anything short of skiing. This doesn't mean that they are good for every occassion and terrain. All shoes are compromises, these just happen to be the best compromises I have so far encountered. The crappiest piece of gear I brought was the Mountain Laurel Good Night EVA foam pad. What I liked about it was that it was full lenght (79 inches, 200 cm) and thin (1/8 inch, 3,2 mm). Now to be fair I have to describe how I use a cell foam pad. Everytime I take a break, cook or whatever, this is what I sit on. I never use a ground sheet. At night I use in the tent, with the Neoair Short on top. This gives perfect sleeping comfort and insulates my legs and feet from the ground. My experiences of EVA is that it is usually pretty stiff and rugged. A pad I like is the MEC Zotefoam EVA Bivy pad, which is 5 mm thick and plenty rugged ( I have yet to tear mine from 2007). The drawback is that it is only 150 cm long, I would prefer 180 cm. 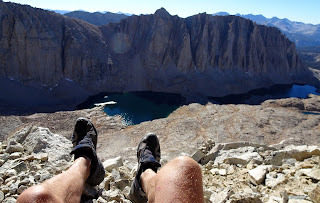 The MLD was the least rugged pad I have ever used. To be fair it was also the thinnest. The EVA was very soft and pliable and tore at the drop of a hat. Step on it or sit on it when there was a rock underneath and chances were good that the rock would pop through, ripping the whole thing. The phot shows it after only a couple of days. At the end of the trip it was pitiful. It ended its days (at least in my company) in a waste basket at my hotel in Fort Simpson. The pad was also too soft, or perhaps too thin, to stay in place at night. 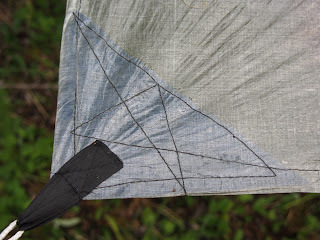 I often woke in the morning with it crumpled, leaving my feet and legs in the sleeping bag resting on the tent bottom. Fortunately ground and and air temperatures were usually pleasant. For less rugged uses than mine it might be allright. However, it is not that much lighter than more rugged/thicker cell foam pads so I'll stay away from it in the future. Both my lighweight Fizan Ultralight Compact hiking poles broke. One broke straight off during my bushwhack walking into the Nahanni watershed. I was hiking through a burn where the ground often is sort of undermined. Baskets on the poles might have been useful since they often pentrated 10-20 centimeters (4-8 inches). Which of course added to the pleasure of hiking by making it an effort to get the pole out for the next step. On one occassion like this I fell and the pole snapped. The other pole received a kink but stayed fairly functional for a week before it also broke. As I have written in my books, when you are dependent on your poles as tent poles it is best if they do not break. You might be able to use sticks you find, unless you are above timberline, but it will still be a hassle. So if you walk a lot off trail I would not recommend the very lightest poles, be they carbon fiber or aluminium. I was really lucky since both poles broke almost at the same place, some 10-15 centimeters (4-6 inches) above the top joint. Also, the construction of the Fizan poles is to be recommended. As can be seen on the photo the expanding mechanism (baby blue) is inserted straight into the tube without any reinforcements or cuffs on the tubing. So it was relatively easy to just discard the broken piece, stick the locking mechanism into the remaining piece and continue to use the pole as before. And luckily the lenght after breaking was (barely) sufficient to keep my tent nicely in shape. So, a very nice pole but a bit light for heavy bushwhacking. The three sections makes it easy to pack as well. I usually bring three kinds of socks plus waterproof Goretex ones; 'warm socks', 'dry socks' and 'wet socks'. The dry socks are for sleeping only, I brought a pair of thin wool socks. The wet socks are the ones I use in my shoes all day; usually thin nylon 'ladies' ankle socks, 50-60 deniers or so. The warm socks are mostly Helly-Hansen pile socks (sometimes I use fleece socks). Those I always use when my feet tend to chill. 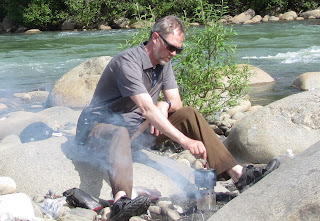 Like when I am cooking my evening meal (above) between Rabbitkettle and Virginia Falls. Big and unwieldy, but that doesn't matter, I seldom walk much in them. I do not really know what to say about the SPOT messenger. I was very satisfied and consciencious with it during my trip, when I sent two messages every day. However I was less satisfied when I returned home and found that only some of my OK messages had actually arrived. According to instructions you should be able to switch the thing off after the 'sending message' icon light had stopped blinking. It does not seem to be that way and information I have since received indicates that you should leave the messenger on for about 20 minutes after the blinking has stopped in order to be absolutely certain. I will have to test that before taking off on some other trip. The thing with bringing any sort of messenger device along is, as I have discovered earlier as well, that people at home expect messages and get worried if they do not receive them. Quite human, I guess. So it is better not to have any messenger device than to have a malfunctioning one. This was something of my Limey friends discovered when he managed to loan a sat phone battery at Rabbitkettle and got his head chewed off by both his wife and his best friend for not having phoned them for a week. 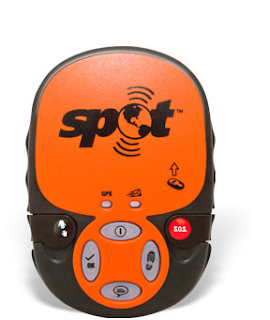 What looks very interesting is a new device from SPOT, the Connector, which will enable you to use your smartphone as a satellite phone, sending messages etc. Soon in a store near you. Still, the battery issue has to be solved. 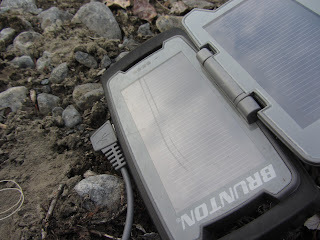 My Brunton Solar Charger came with the reputation 'rugged'. It really was so. Above kan be seen the parallell scratches that I produced inadvertently, while dragging my pack with the attached charger underneath, across a gravel bar. It kept on working like nothing had happened. 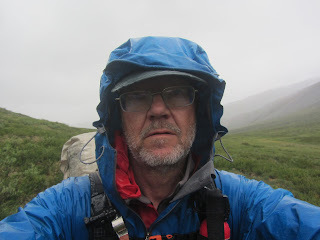 Rain did not affect it neither (for the whitewater where water would wash over my pack I packed it in a dry bag). The downside of the charger was its charging capacity. It barely managed to help my cell phone keep up, batterywise, by adding a charge each day that did not quite match what had been consumed. However, I think this is just a matter of time. Next year or in the near future anyway, the chargers will have improved and the phones will need less juice. However, I would really prefer to be able to run my smartphone/GPS from ordinary store-bought batteries. Lighter and safer. This charger weighed 240 grams. The dry suit was a lucky break. I had not planned to bring one, thought they were too heavy mostly. But when the light MPS Ursuit surfaced it seemed a good idea. 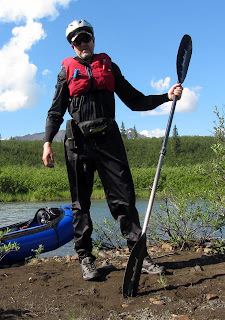 It certainly was and I recommend using a dry suit if you paddle for a long time like I did. I also figured that with the dry suit as backup I could leave my rain pants at home. If it got to chilly without rain pants in the rain I could always use the dry suit. Well, it did and I did. Bushwhacking in cold rain chilled me down very quickly, when I became wet from the groin and down. So I donned the dry suit which kept me completely dry for almost a day. Then the bushwhacking started taking its toll and it started leaking. In spite of my efforts further down the line I did not manage to seal every small hole and it kept on leaking a bit for the rest of the trip. So my dry suit became a wet suit. Still, better than nothing, but in retrospect I should have brougth 200 grams of rain pants and had a completely dry dry suit for the river part of my journey. Thanks Jörgen a very informative report, with lots of helpful hints on use of gear on extended trips. Whilst my MLD pad is still with me and in better condition than yours (I did bay it a bit) I agree about the movement of it under an inflatable pad as you say it may be its thickness that is the problem. Cuben tarps, I feel a MYOG project coming on. Cuben tarps of the unsophisticated rectangular kind I describe are really easy to make. The taping is simple as long as you cut the tape in sections of about 20-30 cm or so. It is extremely thin, so à slight overlapping of the sections is no problem. I know you do not consider yourself to be the Jackie Chan of seamstresses, but making a hem around the thing is a piece of cake. the reinforcement patches are easy as well. I managed to get a small hole in the knee of my heavier Ursuit AWS suit while checking the rapids on my own trip. This only lead the a wet sock at the end of each day and was easy to patch up later on but it's quite clear that lighter drysuits (compare to those made for professional rescue/fishing/military use) can't tkae much bush whacking. 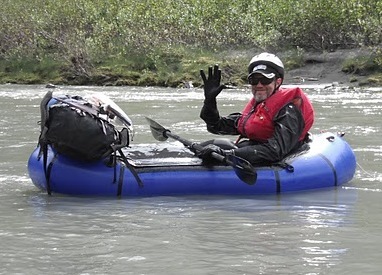 But they are great for packrafting in cold waters! I had the same problem with a SPOT satellite messenger on a recent month-long trip in northern Norway. I usually left it on for another ten minutes after the message had been sent but then always switched it off to preserve the battery. This worked well until finally three consecutive messages weren't delivered. Though in the SPOT manual it says that you can switch the device off or proceed to activate any of its other functions (track progress, SOS, ...) once the sending light and GPS light have stopped blinking in resonance. Jorgen, this is the kind of 'gear' article I like! +1 on trekking shirts with collars! I wore a Rohan Equator shirt this summer with a stand-up collar. Friends and hiking acquaintances were suprised at how smart they can look, something to consider on thru-hikes or world travelling. It's a pity those Thorofare pants are no longer available. I've started using UL nylon travel pants for summer backpacking but they lack that bit of stretch that my other softshell pants have. I have the Gossamer Gear version of that EVA foam pad. I agree with your summary. Nice and light but far too fragile and compressible. I've switched back to a CCF pad after watching how simply you achieved such comfort on rest breaks during our Vaalaadalen trip! A full length 7mm thick pad is what I'm after for 'summer' use. +1 on UL trekking poles. I only use my Gossamer Gear LT4s when using my tarp on UL/short/summer trips. Otherwise I take the hit of another couple of hundred grams and use dependable poles. I always leave my SPOT on for 15 minutes after sending an 'OK' message. I'm pretty sure it recommends this in some of the SPOT literature somewhere. I have had the sames problems with the Spot II in Greenland and northern Finland - at some point the messages don't go through for a few days up to a week - maybe depending on the satellite position? I have it ON until the lights are off (10-20min) as it is written in the manual. Nice to see what others like in their gear - I used a similar "sock system" this year and was quite happy. Glad to hear that the GG is similar to the MLD pad, then I won't buy one. 5 mm in combo with the Neoair is sufficient for me except in winter. The best quality material I have used is the MEC one mentioned. To bad it is so short, but it works. I'm thinking of splicing two. Another one is the Multimat Adventure. Also too short, a bit thicker, but compresses more and rips more compared to the MEC. Regarding poles I guess that very light poles in combination with two 88 grams each tent poles for The One would be reasonably safe and lighter than my heay poles (450 grams for both). Jörgen, vet du var man kan få tag i tyvek eller liknande lätt ripstopmaterial i Sverige? Att följa diverse utsidantips och släpa på en "lättvikts"-presenning som väger lika mycket eller mer än vad luftmadrassen gör känns ju inte helt genomtänkt. Tyvek är ju inte detsamma som ripstop, det är ett sk non-woven material. Lätt ripstop (så lätt att det är mödan värt, som du är inne på) finns mig veterligt inte i Sverige. Om du vill ha material som ventilar/inte är absolut vattentätt, så rekommenderar jag www.thru-hiker.com. Vill du ha något absolut vattentätt till en tarp så är Thru-hiker också ett alternativ för sil-nylon, men då rekommenderar jag www.extremtextil.de och Cuben fiber. De har olika tjocklekar, men för tarp funkar det tunnaste. Min erfarenhet av Cuben är mycket god. Tack för ditt svar Jörgen, jag hade tänkt att ha det under luftmadrassen som punkteringsskydd, så det som spelar roll framför allt är motståndskraft mot nötning och stick. Visste inte att tyvek inte är ripstop, svårt att tänka sig när man väl har försökt riva isär en bit av det :) Finns ju någon typ av kraftpapper för kuvert också som är i princip omöjligt för alla utom hulken att riva isär, något sådant är nog lätt och tar liten volym i packningen. OK, då förstår jag intresset för Tyvek. 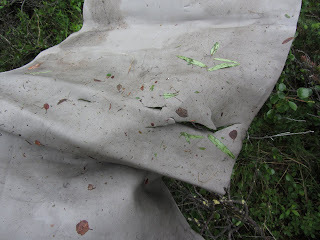 Som någon form av slitstarkt och hyfsat punkteringssäkert "groundsheet" tror jag det funkar bra. Själv kör jag med ett cellplastunderlag under luftmadrassen i delvis samma syfte. Fråga på en lokal byggmarknad efter Tyvek, det används som vindskydd vid byggande av hus. Tyvek är ett varumärke ägt av Dupont, så det kan finnas något liknande med annat namn. Thanks for the nice write-up on gear – lots of good advice here. I'm in the process of getting myself a dry suit for packrafting and are still a bit curious about your thoughts on the lightweight MPS Multi Purpose Suit. Would you recommend it for packrafting as is, or maybe under a light jacket? 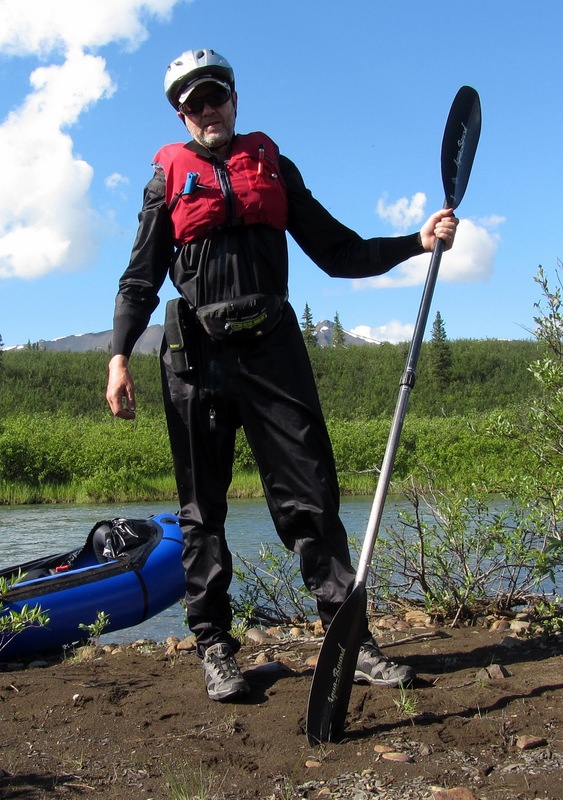 Yes, I would definetely recommend a drysuit like the MPS for packrafting. I would use it in anything but the warmest weather. If you treat it more gently than I did I am sure it would work very well. Only when it was chilly and raining did I put my rainjacket on top of it. Which was rather frequent on the Nahanni, since I since my lower body got wet and cold. My friend in Calgary had a similar suit that he used for sailing. So there might be other brands than the Ursuit worth looking into. Thanks a lot for the info, Jörgen. Thanks for the interesting reading - what a great adventure you´ve had. How do the Thorofare pants and the Salamon Techamphibian work in the matter of bug protection?? I imagine I´d get hundreds of bites on my ankles. The Thorofare pants are bugproof. This goes for all those extremely densely woven materials used in windshirts and the like. So you get bug protection in warm weather without thick and warm clothing. The Tech Amphiban are of course not bugproof at all.And since I usually use very thin nylon socks you would expect the ankles to get ravaged. This has not happened to me so far. 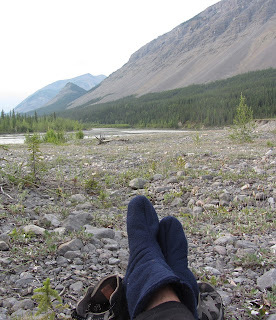 When I hike the pests does not seem to attach and when I take a break I usually put on thick socks (or drape my raincoat or something over the feet). Ultralight guru Ray Jardine and his wife Jenny describe sowing "socks"; bananashaped things in the thinnest nylon, to protect feet and ankles while not walking.